The Insider BASSlog has a wealth of information on bass caught on each lure. For this series, I will cover Carolina rigs. 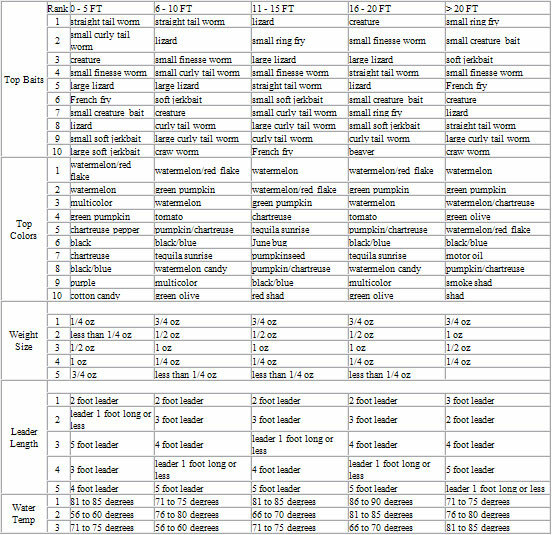 The chart below will give you a good idea of the best baits, color, weight size, leader length, water temp, water clarity, cover, and structure for Carolina rigs at each depth. This chart is listed entirely by numbers of fish caught. As you can see from the chart, good numbers of fish are recorded on quite a variety of different baits. Lizards and creatures seem to be best in mid-range depths, while straight tailed worms are best in shallow water. In deep water, small ring fries have the most fish recorded, followed by small creature baits and soft jerkbaits. Best colors at all depths are watermelon and green pumpkin. 3/4 oz weight is the most popular in all depths except very shallow. For obvious reasons, smaller weights are better when the water depth is less than 5 ft. In deep water, a 3 foot leader is best for the Carolina rig. In other depths, a 2 foot leader is best. The best water temps for Carolina rigs are in the 70s and 80s. Temperatures vary considerably from one depth to the next. See the chart for specifics. Two to three foot visibility is the most popular water clarity for most depths. The exception is deeper water, where clear water is best. The best structures are shallow flats, points, creek channels, humps, and road beds. Best cover is submerged vegetation (where available), with wood cover being second. Good numbers of fish are also recorded in places with no obvious cover. The average weight is slightly bigger in deeper water than shallow water. The average is 2.28 pounds in shallow water, while 2.61 is the average in deep water. In the next blog, I will discuss Carolina rigs for bigger fish.